In an earlier passage dealing with the death of James, Eusebius refers to his letter as “the first of the epistles to be called catholic,” and reports that some deny its authenticity since (as in the case of Jude) few of the ancients quote it. Eusebius himself, however, states explicitly, “nevertheless we know that these letters have been used publicly with the rest in most churches”. Ancient manuscripts of James entitle it an “epistle.” The opening verses of James, with their terse greeting typical of Hellenistic letters, seem to confirm that description. 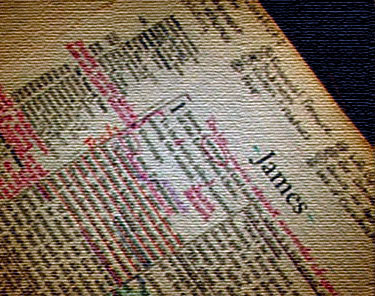 Yet beyond that prescript, James has few features testifying to its epistolary character. Thus although classified as an epistle it lacks any sort of formal closing and signature, any personal greetings, the names of any members of the congregation(s) addressed, or references to specific present situations or past events. It betrays no evidence of the nature or duration of the relationship between James and his readers. In other words, James is hardly a personal letter of the sort known to us from other specimen in the New Testament or the Hellenistic world. In other respects, James differs from the apostolic epistles of Paul, with their assertions of apostolic authority, a lacuna that some Greek manuscripts sought helpfully to rectify by introducing the term “apostle” or even “the holy apostle” following “James”. Outside the letter’s opening, James never asserts his apostolic authority, refers to his past or present labours, or cites personal circumstances to motivate his readers. Gordon Fee defines Wisdom Literature, as written works in Scripture that offer insights that gives one the ability to make godly choices in life, which is achieved by applying God’s truth. Much of this is found in the epistle, since it reflects most Old Testament wisdom sayings, which consists of loosely connected moral maxims. In terms of its form, James’ striking affinities are not with the Pauline letters but with moral instruction and wisdom literature of both the Jewish and Greco-Roman world. Greco-Roman treatises intended to instruct one toward the goals of virtue, conceived of in terms of a well-ordered life marked by virtues such as control of one’s emotions, speech and conduct. Moreover, the letter’s form also alludes to the manner upon which the Old Testament prophets have addressed the Israelites in times past. Chapter 5:1-5 is a perfect example of such style in pronouncing the coming judgement for rich oppressors. As far as the literary style of the epistle, Luke Timothy Johnson, asserts that James ascribes to two times of literary styles that customary during its time: the paranaesis and the diatribe. Moral philosophers during James’ time often employ the use a paraenesis as a style of exhortation. It is a “moral exhortation” or perhaps better an “injunction” that is derived by problematizing the concept and the phenomenon in relation to two connected fields. There is certainly justification for calling James paranaetic, but there is also the need for some qualification, mainly because our understanding of paranaesis has advanced considerably beyond that o Dibelius. For Dibelius, paranaesis was not only the communication of moral teaching, but it was so in a necessarily formless fashion. Paranaetic literature grew by a process of agglutination rather than by authorial intention. The designation of James as paranaesis also meant that no conclusions could be drawn from this composition about the social setting or historical occasion of the writing. While James is a paraenesis, as a whole and in all its parts, in many sections another highly specialized contemporary literary form is also evident – the form known as the ‘diatribe.’ Which may be described adequately enough as copying the style of a speaker engaged in a lively oral debate with an opponent. Diatribes can be defined as a prolonged discourse unto which the speaker utters a deliberately extensive denunciation, of a person or an act perpetuated by a person, such discourses are common in the Roman senate during that time, in literature a diatribe takes shape in a lengthily discourse against an unknown heckler. The distinctively “diatribal” features of the epistle are found primarily within the “essays” of 2:1—55:11, rather than evenly throughout the composition. What is peculiar though in the case of James is that he does not state a clear thesis that is then argued by means of antithesis and demonstration, in the manner of Romans, the New Testament’s most impressive example of the diatribe. Moreover, the epistle’s use of scorn and humour in its appeals exhibits further features of a diatribe with 2:16 functioning as a classic example where James speaks of the rich man cordially welcomed to church while the poor man is coldly neglected is an inimitable picture, and not to mention the calm dismissal of the needy, with a heartless “Goodbye, keep warm and have plenty to eat,” as a clear show evidence of the epistle’s diatribal nature. This entry was posted in Biblical Studies, Theology and tagged Catholic Epistles, Epistle of James, Hermeneutics, Literary Genre, Wisdom Literature by Chuck Baclagon. Bookmark the permalink.